The design was a square with the war memorial at the centre. The actual memorial is a red granite pillar, apparently broken off at the top, symbolising the lives cut short by the war. There are 114 names inscribed. As with most war memorials, World War Two names were added later. Carterton’s war memorial was unveiled on 13 February, 1921. Minister of Internal Affairs George Anderson performed the ceremony by removing the large union jack flag encasing the memorial. He was seconded by Alexander McLeod MP, William Howard Booth (Mayor of Carterton) and Brigadier-General Herbert Hart, representing returned soldiers. 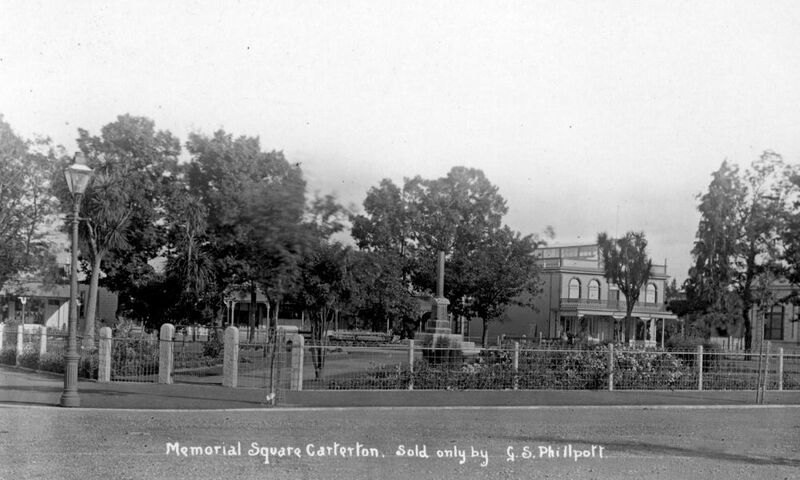 Since the 1930s Memorial Square has been administered under an act of parliament – the Carterton and District Memorial Square Act (1932). In 2006 Memorial Square was partly redesigned.